The only reason why I don't consider this the best Brother's Yard release is because of "Evolver". It's a matter of taste, really, but that one simply takes the crown in my opinion. Anyways, this is truly special, as in my ears, this where Petar Dundov fully came onto his own with this moniker. He mastered the machines, and has made a distinct step away from the previous (still quality) raw sound aesthetic, associated with labels like Expire, ABsense, E-com or ZET. Still on the harder tip, Sentinel further explores industrial overtones and focuses on progression and musicality, despite the rather reductionist aesthetic these techno tracks have up on offer. You will still get locked in the groove, but these are not utensil loops on repeat. These tracks move - constsantly - although they never abbandon the rusty mechanical ambience. The production vaults are notably better than on some of the previous records, and taken into consideration that these are floor stomping tunes, Petar Dundov really makes the most out of his equipment, lacing them with supplementary edits, quirky passages and the occasional odd effect to keep things moving where most get lost in unnecessary hammering and eagernss to come across as "grey". Even though this is more refined and polished than his previous endeavours, it still packs a great punch for the dance floor. Attention to detail is worthy of a mention. Take "Sentinel": it's a ten minute barrage, yet it will fly by you with its echoing pulses, miniatures and tricks pulled out of the sleeve to make every break sound different than the last one. One impressive aspect of his work was, whilst unquestionably forged for the dance podiums, that his tracks always had enough substance to serve as stand alone pieces as well. These are hard, abrasive and banging manifests of techno music, but if you want to hear those done just right, you ought to stop here. 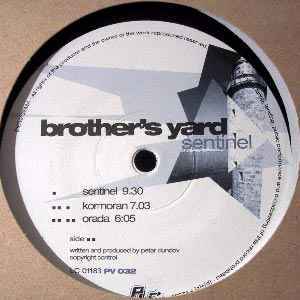 All Brother's Yard releases are worth lending an ear to, but at the turn of the milenium his sound really started to fully develop and sound authentic. Great, driving, purism here. Like all of Dundov's works, this is a minimal-industrial single with a complex structure of layers that keeps it away from the average production. A clear sense of musicality and thickness are its main features. After all, we're talking about a dj tool.